1) How did you get the idea for the book? In 1995, I began to investigate my maternal grandmother’s Virginia heritage. I knew she was born in the spring of 1891 in Buckingham County and, before she was two years old, was taken to Iowa to live, breaking over 270 years of ties in Virginia. When I set out to discover her family history, all I knew was her father’s name. 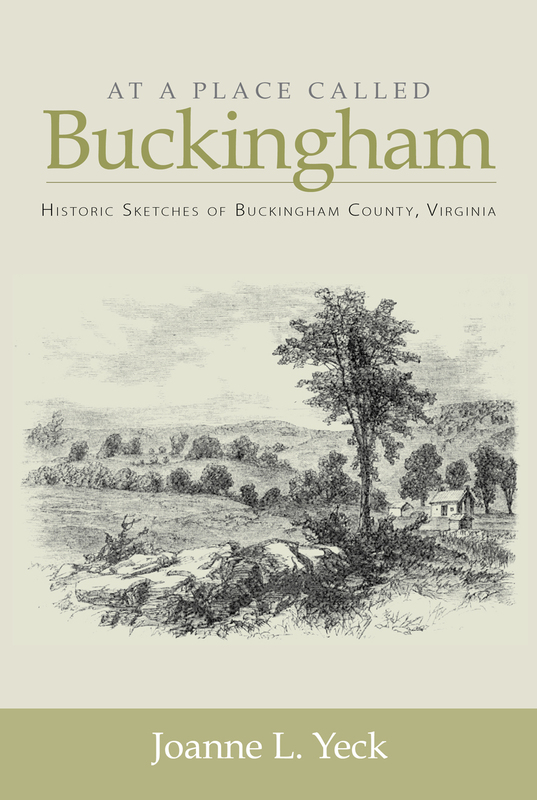 Eventually, it became clear that some of my ancestors were among the Buckingham County’s founding fathers and mothers; I wanted to know more about their lives and the place they lived. 2) What kind of research did you have to do to write about Buckingham County’s history? Once I discovered that the courthouse burned in 1869, it became clear that digging into my Buckingham roots might not be so simple. I quickly came to understand that much of the richness of Buckingham’s past was invisible, in part due to the loss of virtually all of its public documents from its inception in 1761 until early 1869. This was coupled with the burning or destruction of many of the county’s 18th and 19th century houses and other structures. Along the way, many cousins who had never lost contact with Buckingham’s people and places came to my aid, sharing memories, family stories and photographs. 3) Who’s your favorite character in the book and why? A few Buckingham personalities, such as Peter Francisco, a hero of the American Revolution, or Dr. Carter G. Woodson, the father of Black History, are well-known far beyond the county. Over the years, however, I have learned about many other men and women who, in much quieter ways, determined and enhanced Buckingham’s culture. Their values and hard work touched the lives of my ancestors and, by extension, me. My favorite ‘character’ in the book is Miss Lulie Patteson, who was Buckingham County’s first historian. Her dedication to Buckingham’s past fueled her many newspaper articles and inspired me. 4) When did you first know that you wanted to be a writer? Have you had other jobs along the way? By the time I was twelve I announced I wanted to be a writer. My father was a writer, but that wasn’t what influenced me. I wanted to be able to live anywhere I wanted, work any time I wanted (night or day), and never have to get dressed up to work! Over the years, I also taught college courses in cinema studies, worked in a motion picture archive, and homeschooled my daughter. 5) What’s up next for you? Another book, of course! I’ve just finished ‘The Jefferson Brothers,’ which tells the story of Thomas Jefferson and his only brother, Randolph. Now I’m choosing the illustrations, which is always fun.